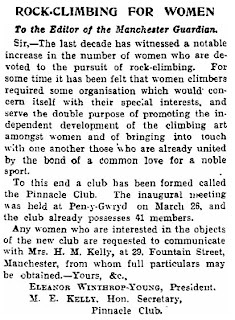 In 1922 women in England could climb mountains (many in trousers after hiding their skirts at the beginning of a climb) but they couldn't vote unless they were over 30. Dorothy Pilley in her book describes a funny experience she had while climbing in the Italian Alps. A man from a nearby army camp was camping up a mountain with Pilley, Richards and their Swiss friend to ensure they did not make off with some blankets the soldiers had lent them. 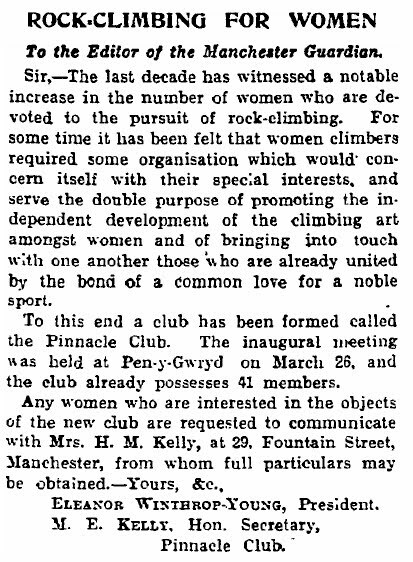 Pilley explained to him that he was in safe hands by showing him her Ladies Alpine Club badge. He replied to this gesture by making the sign of the cross and muttering something. Pilley became quite angry with him and had to be calmed down by the others. This newspaper extract and Pilley's account really show the 'uphill struggle' these ladies had to be taken seriously in the 1920s.